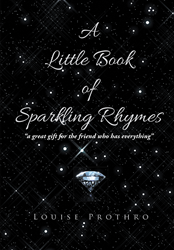 Recent release “A Little Book of Sparkling Rhymes” from Page Publishing author Louise Prothro is a unique twist to poetry. The book of rhymes flows melodically and keeps the reader captivated. Louise Prothro, a mother, grandmother, Air Force widow, traveler, Russian music and literature fan, poet and author, has completed her new book “A Little Book of Sparkling Rhymes”: a vibrantly crafted work that depicts the beauty of words and poetry. Published by New York City-based Page Publishing, Louise Prothro’s compilation of poems describes a lifetime of memories. “These little poems and jingles were written over a number of years, starting in high school, when poetry writing was required. They cover a variety of experiences, some happy, others sad. However, not one would arouse anger or controversy,” said author Louise Prothro. Readers who wish to experience this honest work can purchase “A Little Book of Sparkling Rhymes” at bookstores everywhere, or online at the Apple iTunes store, Amazon, Google Play or Barnes and Noble.